Little Shop of Horrors is a comedy horror rock musical, by composer Alan Menken and writer Howard Ashman, about a hapless florist shop worker named Seymour Krelborn who raises an alien plant that feeds on human blood and flesh. The musical is based on the low-budget 1960 black comedy film The Little Shop of Horrors, directed by Roger Corman. The music, composed by Menken in the style of early 1960s rock and roll, doo-wop and early Motown, includes several well-known tunes, including the title song, "Skid Row (Downtown)", "Somewhere That's Green", and "Suddenly, Seymour". 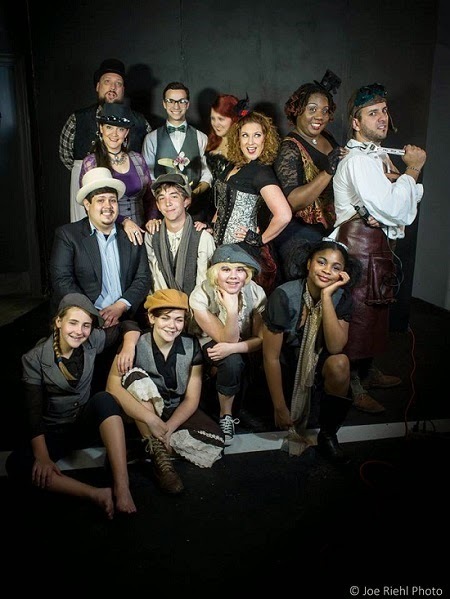 The Cite Des Arts production, under the direction of Christy Leichty, is an early celebration of the Steampunk and Maker’s Fair which will be held in Parc San Souci, November 15th. The show features a live band lead by Esther Tyree, and the cast includes many of Acadiana’s talented actors and singers including Travis Guillory as Seymour, Madelyn Kelly as Audrey, and Heath Swain as Mr. Mushnik. Wear a Steampunk Costume to the Oct 31st show, receive a $2.00 discount on the ticket price.